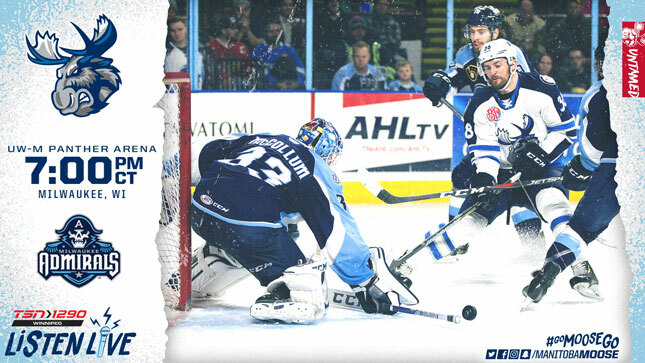 The Manitoba Moose (19-19-3-2) continue the search for road success, tonight in Milwaukee, against the Admirals (22-17-6-1). The game starts at 7 p.m. CT on TSN 1290, moosehockey.com/listenlive/, the Moose App, and streaming live on AHLTV, with the pre-game show beginning 15 minutes before puck drop. In their final game at UW-M Panther Arena this season, the Moose could split their games at the home of the Admirals with a win. Success on the road has been hard to come by this season for Manitoba. The club is 6-11-3-1 outside of Winnipeg, putting their away win percentage 24th in the AHL. Milwaukee is pretty even keel regardless of what building they’re playing in, with a home record of 11-8-2-0. The 11th of those wins came against the Moose on Jan. 26 in the final game before the all-star break. It was a big night for Milwaukee’s Scandinavian prospects, Eeli Tolvanen and Emil Pettersson, who combined for four goals in the 8-2 final. Moose forward Logan Shaw, who represented the team at the AHL All-Star Classic, commented on the team moving on from the rough night against the Admirals less than a week ago. Shaw (18G, 12A), is tied with Seth Griffith (6G, 24A) for the team lead with 30 points. Shaw has scored in all four of the games he’s played against the Admirals this season (once while a member of the San Diego Gulls) and has totalled six points against Milwaukee (4G, 2A). Griffith and Shaw have been two of the hottest Moose players during the team’s push since the holidays. Griffith is on a nine-game point streak (1G, 12A), while Shaw has scored five times in the team’s last seven outings. The Winnipeg Jets’ AHL affiliate’s strongest stretch of the season came after the holiday season, rolling out a 8-3-1-2 mark in the 14 games since. Head Coach Pascal Vincent explained what made the club so successful over that stretch. The Moose continue their three-game road swing tomorrow night (Feb. 2) in Chicago against the Wolves, before one last stop in Grand Rapids on Feb. 6. You can follow the team on social media or moosehockey.com while they’re away.